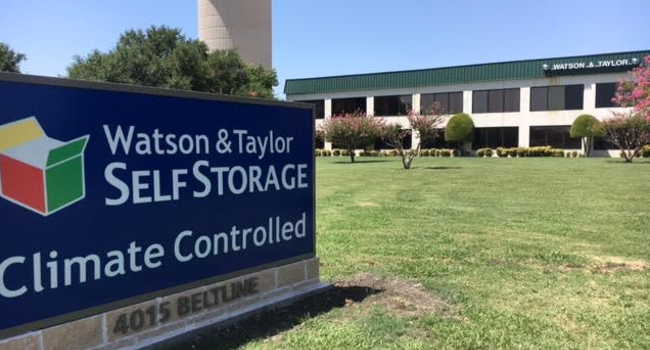 Wildcat Movers is proud to announce a partnership with Watson and Taylor Storage in Addison TX. Watson and Taylor Self Storage in Addison, Texas is the flag-ship storage facility for this outstanding organization. Located just 2 miles West of Dallas Tollway on Belt Line Rd in Addison between Midway and Marsh Watson and Taylor is conveniently located for your residential, and commercial storage needs. Stop by to hear bout the many storage options from one of the Property Managers or Resident Manager. These outstanding individuals will provide you with top notch customer service you will only find at Watson and Taylor Addison. They also rent UHaul trucks and trailers as well as sell UHaul boxes and packing supplies. Watson and Taylor is your one stop shop for self storage units and moving supplies. Featuring LED lighting, 30+ 24-hour surveillance cameras with live feed in the office, controlled access gate system, and tenant insurance plan allows clients of Watson and Taylor to rest assured that their belongings are in good hands.